Essex and Suffolk Pest Solutions provide fast, expert pest control services in Chelmsford. 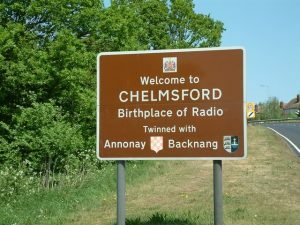 Officially Essex’s county town, over the years Chelmsford has grown in such size and importance that it was made a city in 2012. It is home to around 120,000 people and a wide variety of shops and businesses. Essex and Suffolk Pest Solutions can supply high-quality commercial pest control services in the city and in neighbouring locations including Great Baddow, Galleywood, Writtle and Springfield. Our experienced team of highly-qualified employees will aim to get rid of your problem as quickly and efficiently as possible, using discreet unmarked vans. Increasingly, many retail outlets are now serving food as they compete in the marketplace. This can make their premises more vulnerable to unwanted invasions of pests, as many insects and vermin need food to survive and breed. Our commercial services include beetle and cockroach control, flea extermination, and dealing with mice and rat problems. We can also get rid of any unwanted cockroaches, pigeons and other pests in your premises. We offer the same top-quality, professional service for all our domestic customers as well. We can also provide specialist cleaning and decontamination and pest proofing to help prevent pests returning. Although there was a settlement on the site of the current town dating back to Roman times, Chelmsford only really grew from 1199 onwards, when it was granted royal permission to hold a regular market near a bridge over the River Can. This meant craftspeople would come to live in the town to sell their wares. The market is still a popular attraction in the city today. The excellent transport links also helped the town to grow. Rail services came to the town in the 140s, while the A12 road, which used to pass through the city but now lies to the east, is a vital link to London. Many people from the Chelmsford area now commute to the capital for work. In more recent times, major employers in Chelmsford have included the Marconi Wireless Telegraph Company and the Hoffman ball bearing manufacturers. The presence of these in the town may have made it a target for German bombing raids during the Second World War. Chelmsford now has a flourishing administrative and distribution sector as it benefits from its location in the heart of Essex. It is around 30 miles north of Central London and 22 miles south of Colchester. The town boasts a number of industrial estates and business parks, plus shopping centres including The Meadows and High Chelmer. Essex and Suffolk Pest Solutions can provide pest control services in Chelmsford, Great Leighs, Hatfield Peverel, Broomfield and Little Waltham. We also offer pest extermination in other locations across the county, including Colchester, Clacton, Manningtree and Braintree. If you would like to know more about our services, click on the link above.